Judging by the news coming out of West Africa, one might think the region has nothing but pirates and warlords. But a closer look reveals a diamond in the rough, you may know as Nigeria. Maybe you cringe at the thought of investing there, but that’s more reason to consider it. Here are some noteworthy Nigerian factoids that don’t make the headlines. Indeed, a closer look reveals impressive GDP growth for Nigeria over the past decade (shown below in USD). Meanwhile, the markets don’t seem impressed. The Nigerian stock market is down by more than 75% since 2008. Like most markets, it plummeted in the wake of the financial crisis. But marred by political instability and opaque financial statistics, the Nigerian market hasn’t participated in the global rebound. Currently, Nigerian stocks trade at substantially lower valuations relative to other markets. 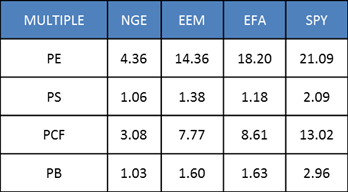 The table below shows a relative comparison of price ratios for Nigeria, emerging markets, developed markets, and the US market, represented by respective ETF data as of March 2017. Nigerian stocks look cheap. But the real question is “are they really?” Some would say there isn’t a price low enough to justify investing in such markets. After all Nigeria is known for extreme poverty, widespread social unrest, rampant political corruption, runaway inflation, and yes even pirates! In fact, Nigeria is so dysfunctional that its government didn’t even know what it’s GDP really was until 2013 when it was restated from 42 trillion nairas to 80 trillion nairas! Long story short Nigeria discovered it had calculated GDP incorrectly for decades and made adjustments. Skeptics question the new, corrected figures just the same, and that may add to why Nigerian stock prices remain depressed. I don’t know which GDP values are right, or if Nigerian stock prices have found a bottom. But regardless of where those things are now, I think it’s reasonable to expect them to move in the right direction over time. Combined with what already looks like attractive valuation, I think broad exposure to the Nigerian stock market at current prices or better will prove to be a good value over time. Of course, there’s still much uncertainty and plenty of risks, so be careful not to bite off more than you can chew (afford to lose).